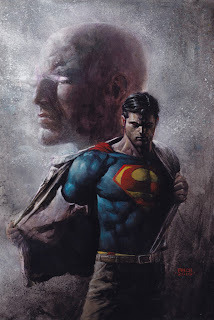 Lots of major comics announcements--like DC releasing the scoop that Superman will be back from his walking tour of America and will return to the pages of his flagship title, Action Comics, with the landmark issue number 900. 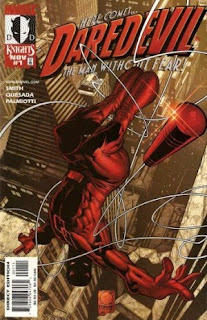 That issues features an amazing David Finch cover (see below), and promises to be extra-sized and full of (sorry, I just can't help myself!) action. And, finally, there was the news that Marvel's Editor-in-Chief for the past decade-plus, Joe Quesada, will be moving full-time into his role as Chief Creative Officer at the company, and that longtime editor Axel Alonso will be taking his place. And that's what I'd like to talk about for a bit today. Quesada's run as EIC was, for me, the definitive run with the company because that's the era in which I started reading comics. And, I think like most people, i started by reading mainly Marvel and DC books. I was definitely spoiled early on, as the quality of the writing and art at both companies in the 2000s was at an all-time high. And, in the case of Marvel, Quesada deserves a lot of the credit in that regard. During his tenure, Quesada brought in big-name, non-comics people (like Kevin Smith and Stephen King) that helped gain attention from the mainstream press, but he also brought in relative no-names in the industry--formerly indy-only creators like Brian Bendis and Matt Fraction and Ed Brubaker. And those are now the names that shape Marvel--and, really, modern comics. While I was still in school, I listened to a lecture/question and answer session that Quesada gave at MoCCA, and it was clear just how much comics meant to Joe. As an artist, Quesada is one of the most dynamic pencillers in the industry, and his classic run with Kevin Smith on Daredevil brought that character back to relevancy. But it's his eye for talent, and his willingness to try something out of the norm that will make Joe's run as EIC one of the best in the company's history. He recognized the force that is Mark Millar, and the writer unleashed hit after hit on the comic book public. He allowed Grant Morrison to go wild on the X-Men, which culminated in one of the most memorable runs in those characters' history...and that's saying something. Not since Stan Lee has an EIC been as fan-friendly as Joe, and his presence at conventions is always felt and always appreciated. He was the face and the voice of my Marvel Comics--in the years of Bendis and Millar and Jeph Loeb and Alex Maleev. So, even though there's pretty much zero chance he'll ever read this--thanks, Joe. I don't know if it's hit your radar, but one very promising book that I just read was Who Is Jake Ellis? I read it on a whim -- probably because "Ellis" made me think of Warren Ellis -- and it's paid off. The art is stylized and makes me think "Vertigo." The story seems to be about a guy who hangs out with criminals but has a ghost advising him -- a ghost named Jake Ellis. I did the same thing--I picked it up after quickly flipping through it in the store. I haven't read it yet, but I'm glad to hear it's good.